If you want a cozy and safe environment in your sauna, you need to use natural timber. Of course, if you do not care about such things, you can always go with other options. • High temperature and humidity resistant under extreme conditions. It does depend on the type of wood, though. The best sauna timber is made of hardwood. It is better to avoid using coniferous wood due to too much tar and the fact that it does not tolerate temperature and humidity. However, when it comes to interior wall decoration, furniture, or accessories in general, nothing beats cedar. • It is easy to work. • It is resistant to deformation and drying, fluctuation of the temperature, fungi, and mold. Moreover, when in high temperature, cedar extracts oils and tar which have a positive effect on a human's body. • Lime. 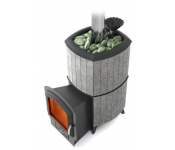 Low thermal power, so the room heats up pretty fast. Durable, does not produce tar, looks beautiful, and creates a pleasant aroma. • Aspen. Soft and relatively cheap. Disadvantages include darkening over time and being prone to tree diseases. • African oak, also known as abachi. Light, durable, heat resistant material. Does not produce tar. The most significant disadvantage is its price. • Pine. The only pine that can be used for saunas is from the northern regions, where there is not a lot of tar in the wood. It is cheap and easy to work. However, they tend to produce a lot of fungi and are prone to break. • Oak. Unique resistance to high temperature and humidity. However, oak is more commonly used for decoration. Oak is rarely used for skirting boards. Too much weight and temperature fluctuation can cause the timber to break. When you finish, avoid varnish and paint. These two prevent natural humidity absorption. Not to mention all the particles that can harm the body. • A tendency to deform when drying. • The presence of harmful tar. 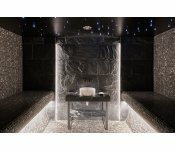 It should be extra important in a place like a sauna, where we breathe the air. Coniferous plants are that much worse in this regard. Therefore, it is probably better to avoid them altogether. • Stained boards for the flooring. You can use either natural or stained timber. Stained boards have a longitudinal spine on one side and a corresponding groove on the other. There is a lock switch which allows you to attach and level the floor covering firmly. It is only natural that stained boards are more expensive. But at the same time, they are higher in quality. • Humidity. Residual moisture is an essential factor of the timber. For flooring, you need to use only dry wood. Wet timber deforms when left to dry. Optimal humidity value is between 7% and 9%. • Dimensions. 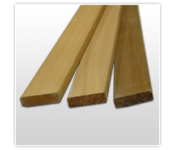 The thickness of the flooring board ensures mechanical strength. It comes down to characteristics of the wood. The most commonly used boards are about 10 centimeters wide. 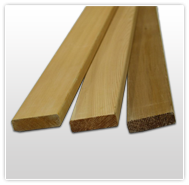 If you are using a well-dried timber, you can go with a width of 17 to 20 centimeters. • Acclimatization. Before you start making the floor, leave the timber in the room for 3 to 5 days for it to get used. • Attaching method. Usually, the timber is attached to logs with nails or screws. The boards themselves should be additionally fortified in the middle. • Processing. Any sauna, no matter the type of timber, requires impregnation with a particular antiseptic to prevent fungi and other micro-organisms. It is imperative to choose the right type of timber and do all the necessary preparation work. 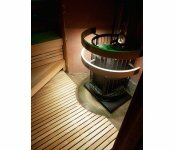 If you do everything right, the sauna will remain in top-notch condition for many years.